ASPC - Foundation / AMHR ~ 34"
"Shetlands may be of any color, either solid or mixed, except appaloosa." I decided to leave D&S Run Around Sue on the mare's reference page to bring attention to an issue that has been swept under the rug for the past 25 years or so. Some time ago, someone felt the need to turn an appaloosa stallion and a dwarf stallion out in his herd of Shetland ponies. 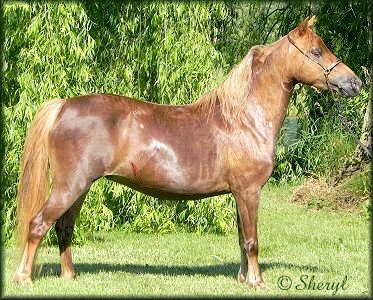 Per the bylaws, the appaloosa coloring is an illegal color, therefore those Shetland ponies with appaloosa color and/or characteristics should not have ASPC papers. Once what took place within this bloodline was brought to my attention, I decided to take a stand to right a wrong. I do not feel it is acceptable to continue to allow people to be deceived by this bloodline, after all, many like myself have put a lot of time and money into building our herds. I am in no way diminishing the beauty and talent of the BHR horses, I am simply bringing this issue to the public's attention so that you can make an educated decision in regards to purchasing a horse from this bloodline. There is a DNA test available to determine if a horse is a carrier of the gene or not,called the LP test. The LP test is different than the Pattern test. The LP test determines if the horse carries one or two appaloosa genes, which the Pattern test determines if the horse carries a particular pattern. I have DNA tested those ponies owned at the time this was brought to my attention; any pony with BHR bloodlines owned by IHF, test results are labeled appaloosa (LP) negative or positive on this site.